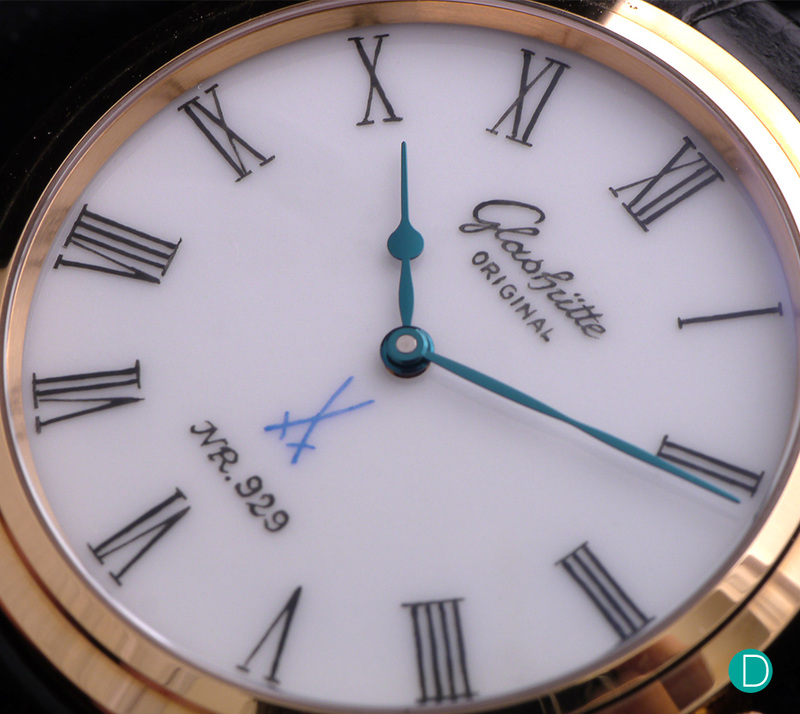 Glashütte Original went into collaboration with the Meissen porcelain company and developed several dials including the “plain” Meissen dial for the Senator series. The Meissen Porcelain Manufactory has more than 300 years of history under their belt starting as early as 1710 in city of the same name in the province of Saxony. But it was not till 1722 when they used the “cross swords” as their emblem. 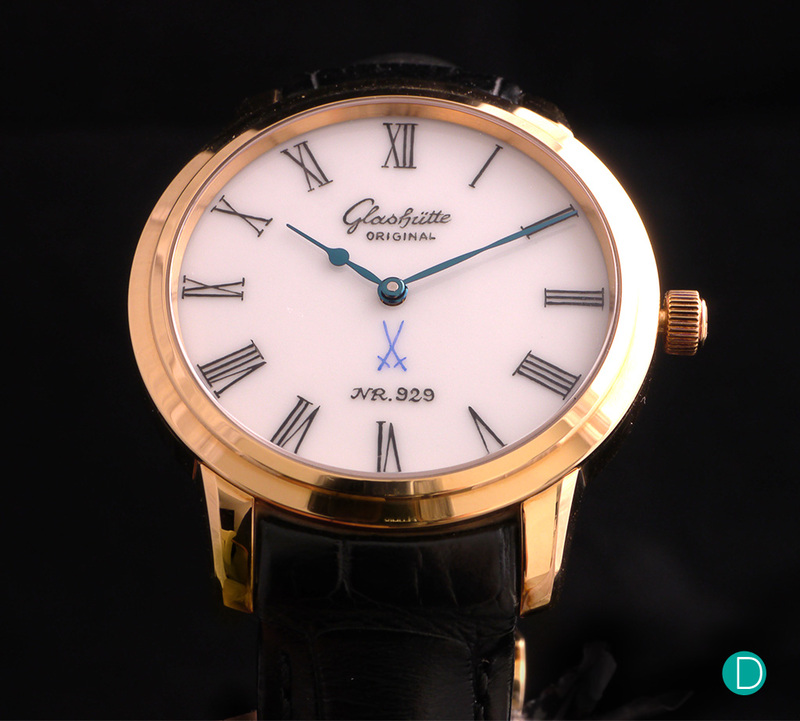 Glashütte Original on the other hand can trace their roots back to the mid 1800s but it was not till 1994 when the former East German conglomerate of Deutche Uhrenfabrik became what is known as Glashütte Original we know today. Combining the best of both companies, Glashütte Original and Meissen collaborated to created the Meissen range for the Senator series. Unlike enamel, porcelain ornaments were highly prized by the royalties and were often given as gifts bearing imperial seals. Its origins were believe to have come from China and is considered as one of the most highly regarded types of pottery – for its delicacy, longevity and milky white colour. Some may ask what’s the difference between china and porcelain – both refer to a similar product just that the term china makes a reference to the origins while porcelain is more associated with the Europeans having its origins from the Latin word “porcella” meaning seashell. Interestingly enough, bone china is somewhat different as they add another ingredient – calcified bone ash. The bone ash makes the dish stronger by making the material softer which in turns makes the material less brittle. Hence, the dishes and cups are almost always bone china. Furthermore, bone china is fired at relatively lower temperatures and the glaze is usually smoother than porcelain. This Meissen sample comes as a two handed time only timepiece. Several other variants were offered, including those with miniature painting and also a tourbillon version. But the review example is the the simplest and most elegant if the lot, and I feel, perhaps most representative of the art. Simple, elegant and very handsome. The classic Senator is aesthetically pleasing, proportionate and neat. The milky white dial combined with the blue cross swords and blue hands adds to the alluring look of the whole timepiece. The blue hands compliments the dial and rose gold case. Why is the porcelain dial desired? For one, they are rather rare and secondly and more importantly, the dials are said to maintain its colouration for decades. 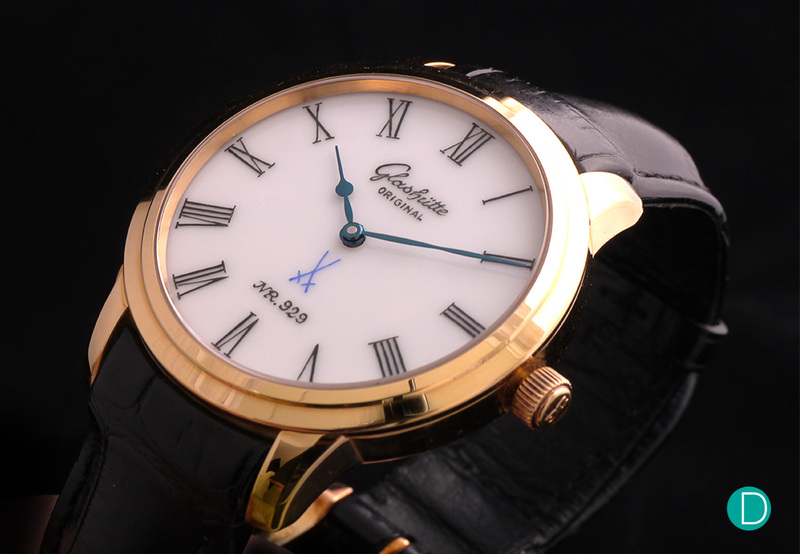 But unlike enamel dials which are very popular for watch dials, not many watch brands choose to make porcelain dials. I wonder why. Perhaps it is the degree of difficulty and the access to the porcelain manufactures, none of which are in Switzerland. 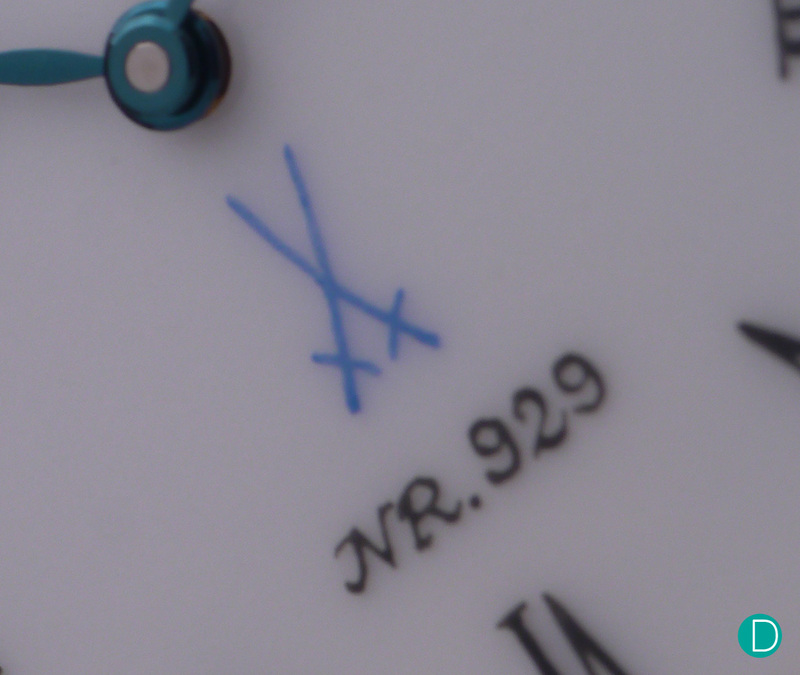 All the markers including the Meissen cross swords trademark and the Glashütte brand name are hand painted on the porcelain dials. Because the paint sets at different temperature, the dials are fired separately at different temperatures to give depth and colour to the handwork. Each dial is individually numbered. The Roman hour markers are also similarly hand painted and fired on the porcelain. So you may ask what’s the big deal of a porcelain dial? Well, for starters the liquid porcelain is applied to a disc and then fired at between 1,200 °C to 1,400 °C. Porcelain which contains clay are typically white. Only discs that meet their stringent requirements are selected and hand painted. In order to achieve the desired results, the craftsmen use very fine brushes to hand paint the markers etc. The porcelain paints are applied and fired separately – different colour will be hand painted and then fired. This will allow the dial to achieve the desired depth of colour. It is said that it take between 8-10 hours to paint one dial and massive amount of concentration too! The hand painting of the markers can be clearly seen in this macro shot – it is not “perfect” but as perfect as the hand can draw. And the blue cross swords and the hands bring a stark contrast to the white porcelain dial. Ah… finally, some “imperfection” so telling of hand crafted products. With the naked eye from afar, one can discern the dial work, the depth and uniqueness of the hand painted porcelain dial. But examine the dial with a high power loupe and what looks crisp and sharp may reveal themselves as a little fuzzy around the edges. 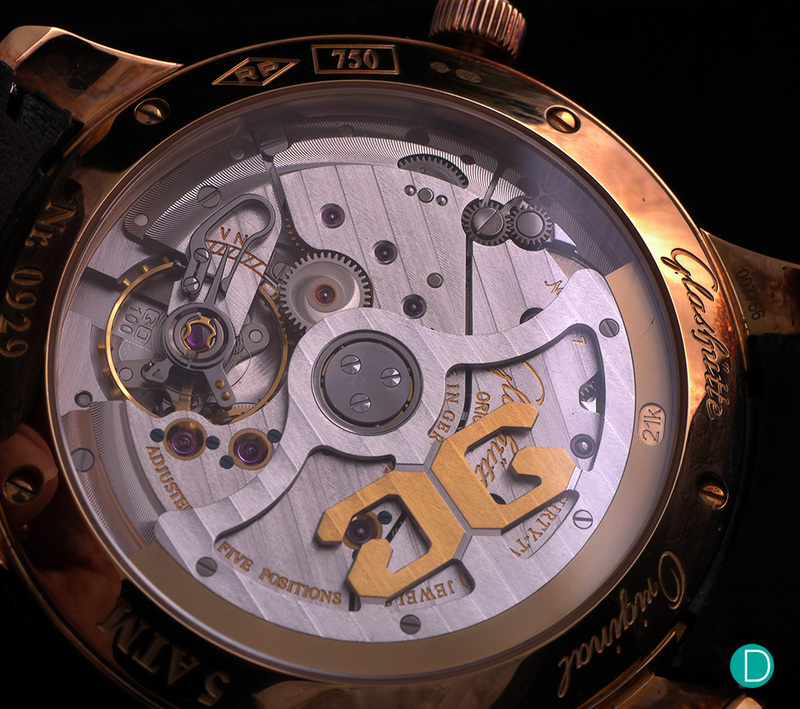 What’s true about such hand painted dials is that no two are alike which makes each timepiece unique. 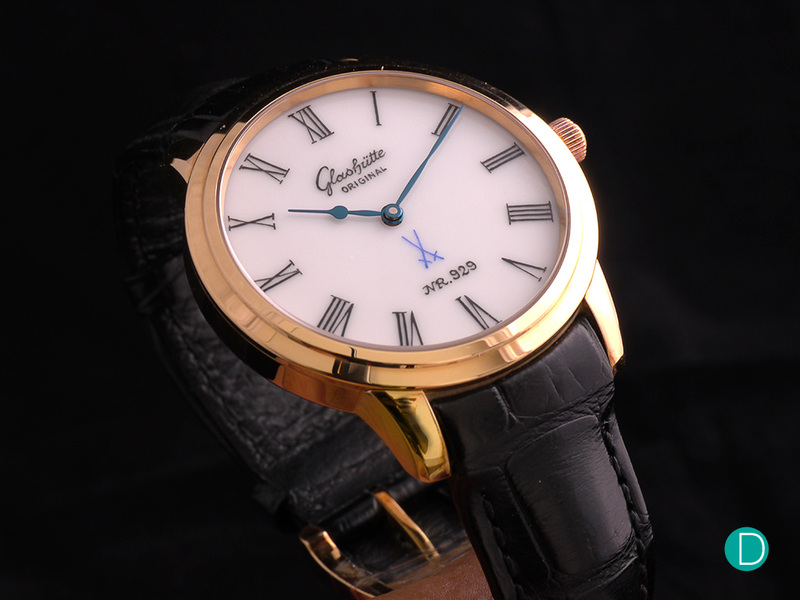 This classical timepiece is in a rose gold case and measures 40mm. 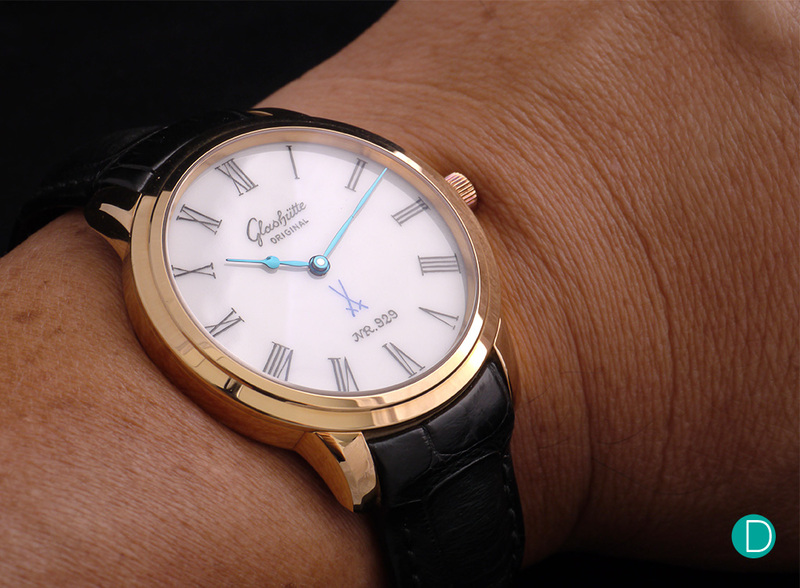 The combination of the rose gold case and the porcelain dial certainly gives the timepiece a flawless vintage feel. The case is polished on the outside, and brushed on the interior. Beating inside is the in-house Glashütte Original automatic calibre that beats at 28,800 vph. 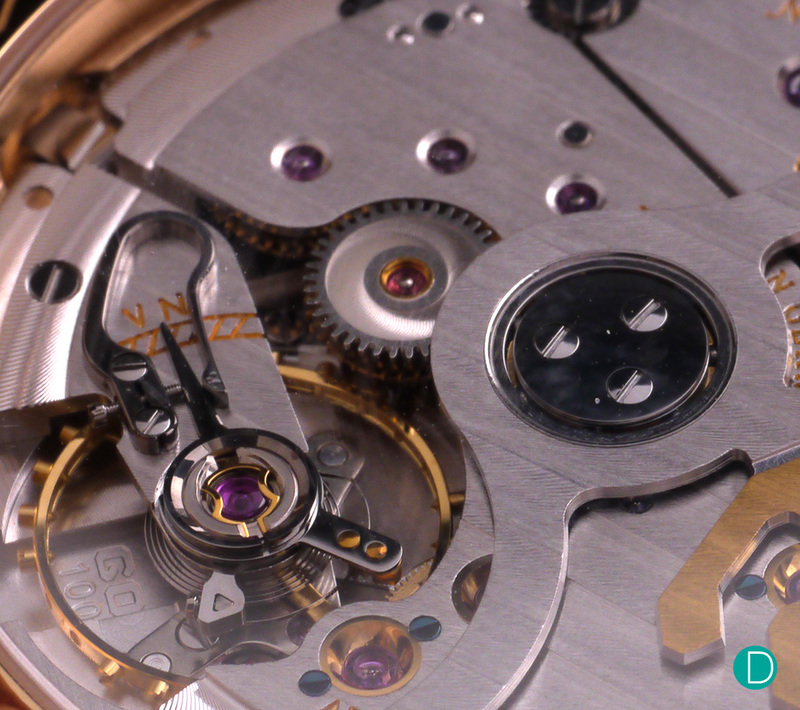 The movement provides about 55 hours of power reserve and finished in the usual Glashütte ribbing. The watch was introduced in Baselworld 2008, and Glashütte Original has since discontinued their collaboration with the Meissen Porcelain company which is rather unfortunate. Porcelain dials are difficult to manufacture and blending the best of both brands was a win-win. Perhaps they will reignite that collaboration again but in the meantime, what’s out there is what’s out there.